The Draft’s Rorschach Test: What Will Each Team See in Patrick Mahomes? CARLSBAD, Calif. — First it was the video from spring ball: Patrick Mahomes coolly executing a no-look pass. “Doing his best Aaron Rodgers impersonation,” Texas Tech coach Kliff Kingsbury posted on Twitter. A few weeks later, another video surfaced: Mahomes, both knees on the turf, launching a perfect spiral 65 yards. It felt as if everyone around Mahomes was trying to sell the skeptics on his talent. The QB class of 2017 includes some typical prospects: the Golden Dome legacy (DeShone Kizer), the late-bloomer with the big arm (Mitch Trubisky) and the college superstar whose game has been dissected under a microscope (Deshaun Watson). Most years, teams would overlook the up-and-down gunslinger carrying the Air Raid stigma, brand him as a developmental prospect and relegate him to Day 3. But none of the usual suspects have solidified themselves as a Round 1 pick. And now, with the draft two months away, it seems NFL front offices are opening their mind to Mahomes. Mahomes has the face of a teenager but carries himself like a much older man. He maintains eye contact and talks fast; his Texas drawl is accentuated by unrelenting energy. And as he details his journey, you’re inclined to believe every promise he makes. For his entire life, Mahomes has been precociously assertive. “It’s understandable why people would think I’m just another Air Raid guy, not ready for [the pros],” he says. “Quarterbacks who came from our system haven’t done well in the NFL; that’s a fact. Before the gridiron, there was the diamond. Mahomes was born in September 1995 when his father, Pat Mahomes Sr., was in the final weeks of his fourth season with the Minnesota Twins. The elder Mahomes, a 6' 4" right-hander, would pitch seven more seasons for five different teams in the majors, and bounced around the minor leagues for another five seasons after that. Little Pat followed. When he was 2 ½, the family moved to Puerto Rico for winter ball, bunking with his godfather, LaTroy Hawkins. 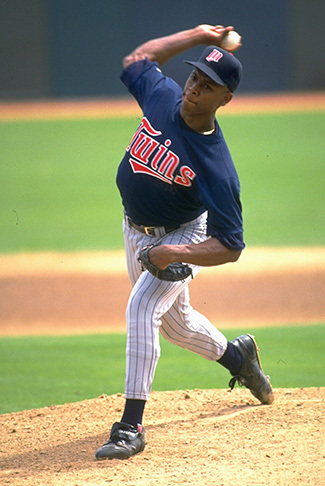 Hawkins spent 21 seasons in the majors, first as a top prospect in the starting rotation, then as a shutdown reliever. And for one winter, he served as Little Pat’s personal waiter. Little Pat would wake up at 2 a.m. crying for Hawkins, with a specific request. Troy! Troy! French fries! I want them now! “He knew there was a Burger King across the street,” Hawkins says. “And he knew it was open 24 hours.” Hawkins usually obliged. Pat ate the fries, then fell back asleep immediately. Their bond remained strong, Hawkins serving as a mentor as Little Pat became a star in his own right. Mahomes spent the school year in East Texas and summers on the road. He took batting practice with Alex Rodriguez, fielded ground balls with Derek Jeter. “Now that I’m older I realize that stuff wasn’t normal,” he says. When he was 9, Mahomes not only made the 11-and 12-year-old travel team, he was the starting shortstop. When Mahomes Sr. retired from baseball and began coaching youth basketball, his son was the star. But in seventh grade, Mahomes began playing football, invigorating a passion. He was a high school quarterback, but when he attended his first camp, at the University of Texas, the coaches said he could be a great safety. And so goes the story, now retold lovingly by Pat Sr., of a conversation between father and son during the car ride back from Austin: The elder Mahomes asked his son why he was messing around playing football when his true talent was on the diamond. The younger Mahomes’ fastball was clocked at 95 miles per hour. All 30 MLB teams had sent scouts to see him. In one meeting, an MLB scout told the 17-year-old his base projected earnings in baseball, his worst-case scenario, would be $1.6 million for his career. Mahomes said thank you, and that the assumption was correct: He was dead set on moving to Lubbock, where he would play quarterback for Texas Tech. • DAVID NJOKU AND THE COMBINE HEADLINERS: The high-jump national champ turned tight end, plus a handful of small-school stars to watch and everything else to know heading into combine week. Mahomes’ collegiate statistics were gaudy. Last year, as a junior, he threw for 5,052 yards, completing 65.7 percent of his passes, with 41 touchdowns and 10 interceptions over 12 games. He averaged 49 pass attempts per game. That includes the backyard football bonanza against Oklahoma in October, when Mahomes set a single-game FBS record with 819 yards of offense, accumulated over 100 plays (88 passes, 12 runs), along with seven touchdowns (five passing, two running). Oklahoma won, 66-59. Even Mahomes didn’t realize the absurdity until midway through the fourth quarter when his freshman-year roommate, wideout Hunter Rittimann, accurately reported: “Dude, you have like 700 passing yards.” Mahomes claims his arm wasn’t sore the next day—“I think pitching conditioned my arm”—though he threw for a season-low 206 yards the following week, in a double-overtime win at TCU. Here’s the first thing that gives evaluators pause. The Red Raiders run a variation of the Air Raid offense, popularized by former coach Mike Leach (Kliff Kingsbury, Tech’s current coach, played quarterback under Leach). It’s a quarterback-friendly system, pass-happy and full of quick-strike plays, leading to huge (and what many would call inflated) statistical outputs. According to most NFL evaluators, the system doesn’t translate to the pros because it’s so heavy on predetermined reads. An NFL scout who studied Mahomes’ tape said that while he was under center some, it was sparingly and usually in short-yardage situations. Mike Sheppard, the longtime NFL assistant who is tutoring Mahomes, is working on his five- and seven-step drops and rhythm throws, separating the drop from the throw. Mahomes says he had a little bit of an extra step in his left foot because of being used to the shotgun, a habit he fixed in about two weeks. 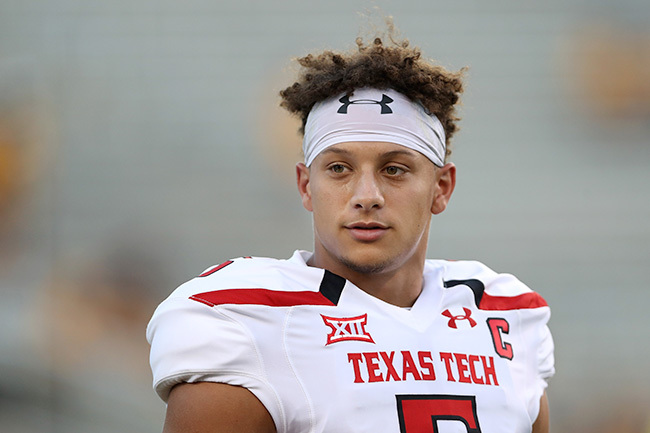 Another thing Mahomes will stress in Indianapolis: He had more responsibilities in Lubbock than you think. 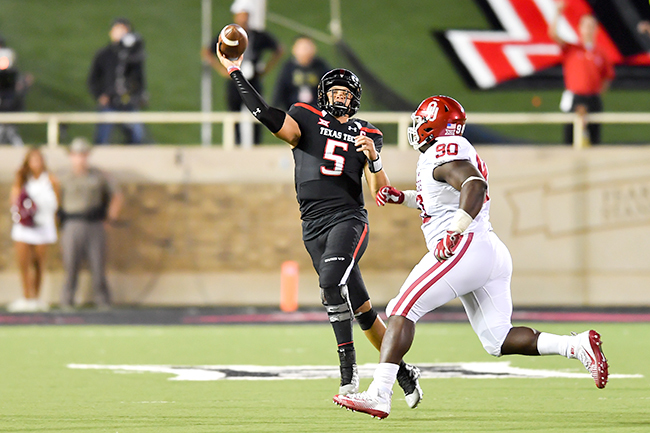 Kingsbury allowed Mahomes to begin checking plays at line of scrimmage during the quarterback’s sophomore year, and by last year Mahomes could check any play he wanted. In fact, Kingsbury’s sideline signals were an exception—he used them only when he wanted Mahomes to keep his play no matter what. A scout said that is unusual for a college spread quarterback. It was a virtue of Mahomes starting 28 games. • DESHAUN WATSON, ACCORDING TO THE NFL: Our panel of NFL quarterbacking experts—long-time coach Mike Shanahan, Browns QB Josh McCown, and retired star Randall Cunningham—share what they see in Watson. Mahomes says his new habit helped him cut interceptions down from 15 in 2015 to 10 last season (despite a slight uptick in pass attempts). Perhaps next year he’ll even begin TiVo-ing his games, he says. NFL teams hope Mahomes continues on that curve. There are two common refrains from NFL evaluators: (1) Mahomes could have the strongest arm in the NFL draft, and (2) He needs to clean up footwork and improve his decision-making. Watching Mahomes invokes memories of Kingsbury’s most famous pupil: Johnny Manziel, who played under Kingsbury when the coach was offensive coordinator at Texas A&M. Mahomes is a bigger, sturdier, harder-to-tackle version of Manziel, and his arm is far stronger. And in nearly every game, Mahomes is improvising and resetting on the move, juking defenders and hurling the ball deep. When Mahomes weighed his decision to declare, he again consulted his godfather. Hawkins, who spent two decades in major league clubhouses, devised a litmus test. He used Alshon Jeffrey as an example (for no other reason than Jeffrey was on his fantasy team). Mahomes didn’t hesitate; he said he’s been waiting for that moment his whole life. And for an NFL team, that moment could be coming sooner than anyone thought.